Compute complex arc hyperbolic cosine. Compute complex arc hyperbolic sine. Compute complex arc hyperbolic tangent. Compute principal value of natural logarithm of z.
Compute principal value of decimal logarithm of z.
Compute power function with real exponent. Compute power function with complex exponent but real mantisse. Compute principal value of square root. Compute euclidian norm of complex number. Compute complex argument hyperbolic cotangent. 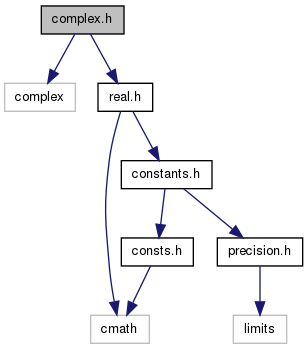 Compute complex argument hyperbolic secant. Compute complex argument hyperbolic cosec. Compute complex arc tangent fortran like function. Compute principal value of binary logarithm of z.
Euclidean distance function for complex argument. Euclidean distance function for a double b complex. Euclidean distance function for b double a complex. Complex round Round is the nearest integral value Apply round to real and imaginary part. Complex trunc Apply round to integer, towards zero to real and imaginary part. Magnitude in dB Compute . Construct a complex number using polar notation. Extension of polar construction to complex. Converts impedance to reflexion coefficient. Converts reflexion coefficient to impedance. Converts admittance to reflexion coefficient. Converts reflexion coefficient to admittance. Complex ceil Ceil is the smallest integral value not less than argument Apply ceil to real and imaginary part. Complex fmod Apply fmod to the complex z.
Heaviside step function for complex number. Bessel function of first kind. Modified Bessel function of first kind. Inverse of complementart error function. Definition at line 31 of file complex.h.